You don't have to hide your smile. Replace missing teeth with the most natural looking solution of all. Missing teeth can affect you in so many ways: they can affect your confidence and self- esteem. They can change the way you smile (or prevent you from smiling at all). And if you’re missing a number of teeth, they can alter your appearance and even change the way you eat and speak. There are various ways of replacing missing teeth. Dental implants tend to be the most natural looking, the most durable and the easiest to clean (because you clean them just like ordinary teeth). They can be used to replace one tooth or several. Implants also feel like your own teeth, so the way you eat – and the way you speak – don’t change. 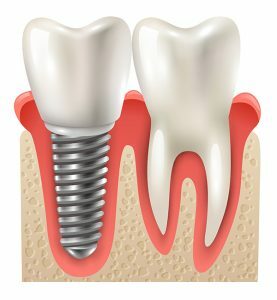 A dental implant replaces the root of a missing tooth with a titanium screw. A crown or denture is placed onto the screw creating a natural looking ‘false tooth’ that should last as long as you care for it. Treatment is usually carried out in stages: the screw is fitted first; the crown later. For a whole row of missing teeth, completed in a single stage, try our All on 4 Implants. The first thing we’ll need to assess is the condition of your jaw. If there isn’t enough bone for the implant to sit securely, or if the bone isn’t healthy, dental implants may not be suitable for you. The treatment takes place under local anaesthetic so you won’t feel any pain during treatment, and the process itself is a little like (and often a little easier) than a tooth extraction in reverse. You’ll feel some soreness around the affected area in the week after treatment. Over the counter paracetamol should help manage this. Single teeth implants start from £1,500. An implant-supported denture (for several teeth) starts from £5,000.